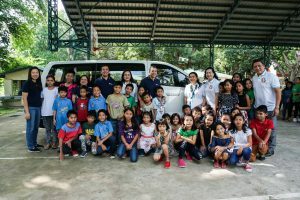 Ayala Foundation visited last October 6 the Christian Mission Service Philippines (CMSP) Children’s Village in Naic, Cavite, to formally turn over a service vehicle donated by BPI Family Savings Bank. The vehicle donation came as a replacement for a 12-year-old service vehicle for the children residing at the Children’s Village, as well as the members of the service staff. The official turnover was supervised by Ayala Foundation President Ruel Maranan, who encouraged the children to continue striving to become the best that they can be. In particular, he noted the children’s talent in music and dance, drawing parallels to the students who strove hard to excel by participating in the CENTEX after-hours program in dance. The Ayala group has a long-standing partnership with the CMSP. In 2013, Ayala Foundation worked with Ayala Corporation for the construction of the Children’s Village Sports and Activity Center, which was inaugurated by Ayala Chairman Jaime Augusto Zobel de Ayala. Ayala Foundation also connected Children’s Hour with CMSP for various initiatives. Also present at the turnover were Atty. Estrella Zaldivar, treasurer of the CMSP Board of Trustees; Pastor Keith Quebral, CMSP corporate secretary; and Dinah Udarbe-Macaranas, CMSP executive director.